I have a secret to share with you today. I don’t share this secret with any ol’ Joe because, well, there are certain things that a blogger only shares with her beloved readers. Dirty little secret things. 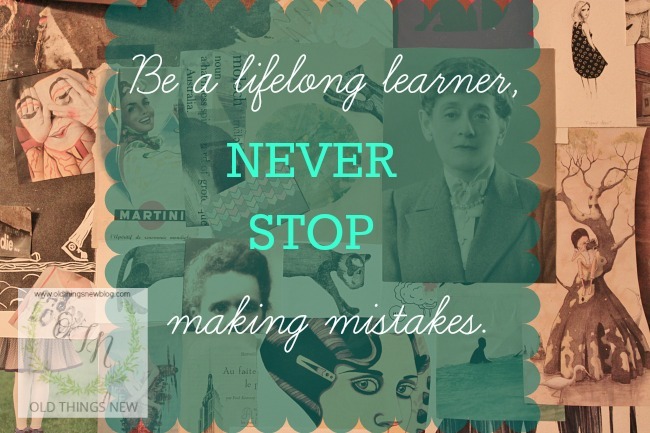 Has there ever been a time in your life when you were absolutely sure about something but you turned out to be wrong? Maybe it was the lunch date you were supposed have with someone, only you got there a week early. Maybe it was the directions to a place you know and have been before, but this time you got hopelessly lost. Maybe it was as simple as laying your glasses down in a safe place and then, when they go missing, blaming someone else in the house for moving them! Nope they were on your head all along. UGH!!! Mr. OTN and I are quite alike in believing that we are right all most of the time so it often comes as a surprise when one or the other of us is proven wrong. I say often because it seems the older we get, the more often it becomes. 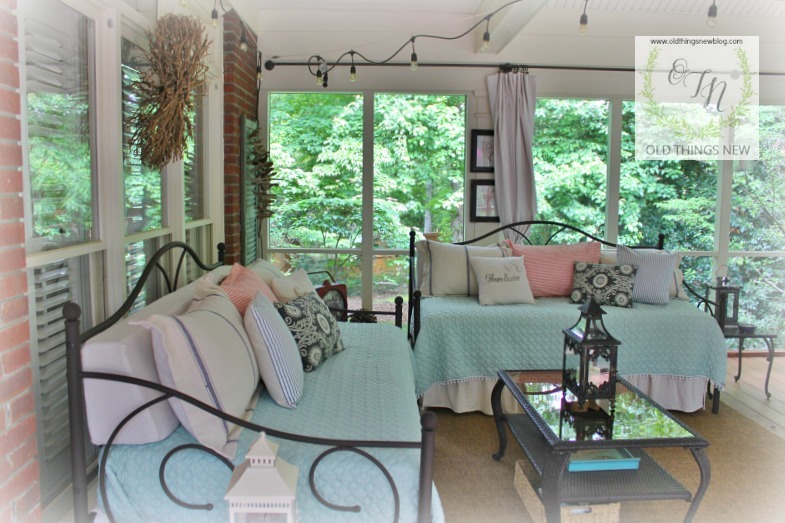 Today, since the weather is feeling a bit like Summer, I’m finally sharing pictures of our Sleeping Porch. We actually started using it last Summer but I never got around to posting about it, other than on Instagram. I’ll tell ya’, you are missing out on a lot of the day-to-day excitement of my life (tee hee) if you aren’t following along on IG. 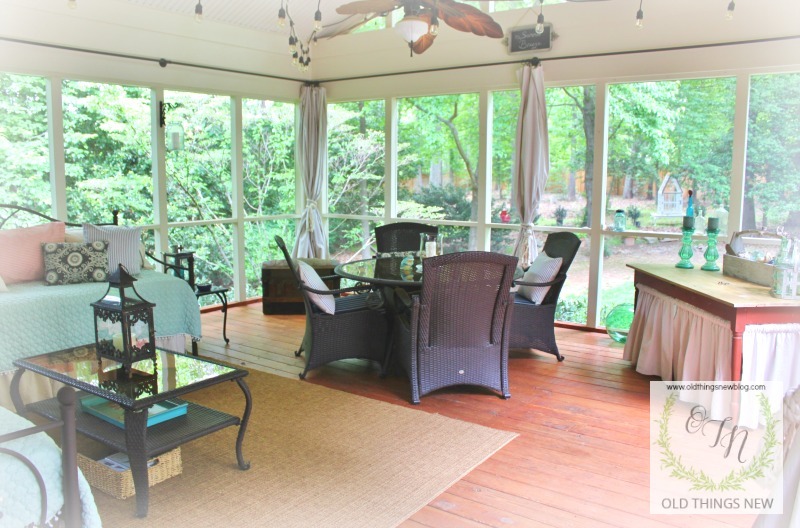 Here is a picture of our Screened Porch where we spend much of our time – Spring, Summer, and Fall. We swapped out our love seat, and two chairs with ottomans for daybeds. This created more floor space in the room and didn’t take away any seating. What it did do was give Mr. OTN and I each our own spot to take a nap. 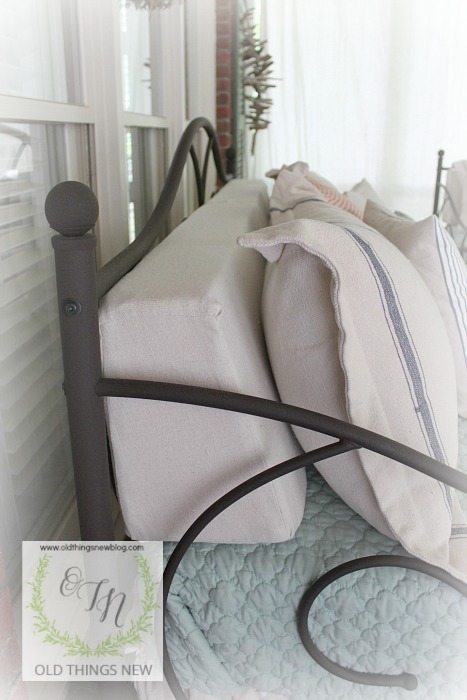 NOTE: I’ve included links at the end of this post to full enclosure mattress and pillow covers, similar to those I used on my porch as protection against moisture. 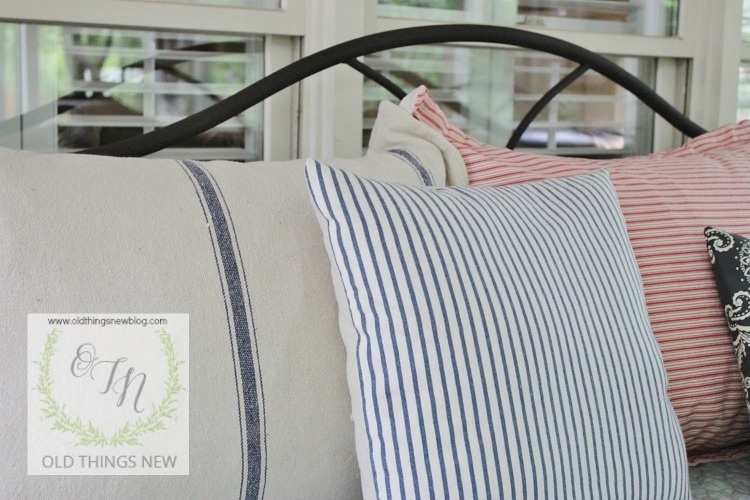 I recovered the old throw pillows we already had in this room with thrift store and drop cloth fabrics. I really lucked out as our local Habitat store had huge bins of fabric samples, large enough to make pillow covers. For back support I ordered large wedges of foam online and made washable drop cloth covers for them. 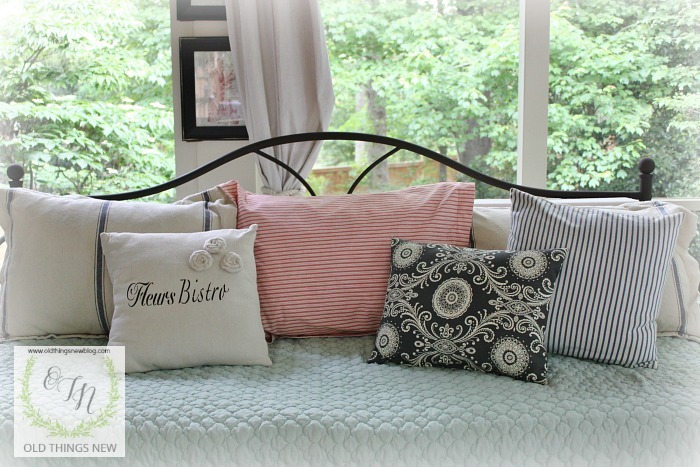 I purchased bed pillows to use in front of the bolsters and made envelope pillow covers for those too. 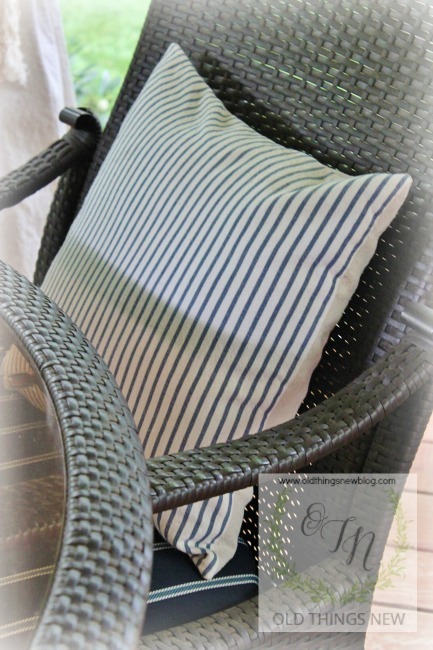 Here is link to post I did last year that tells how to make Envelope Pillows. 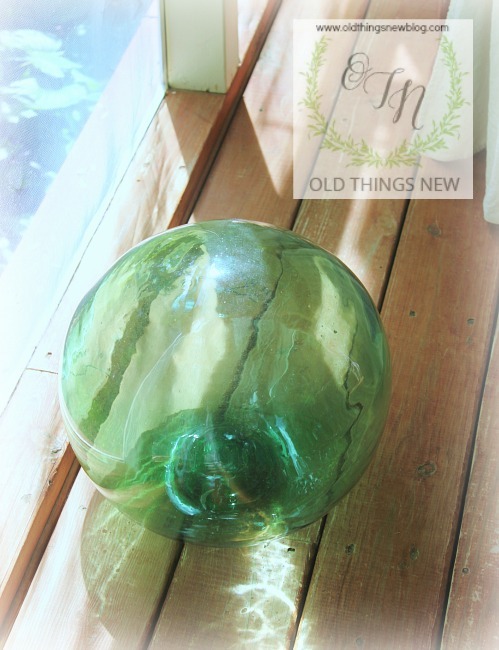 They are super easy to do! 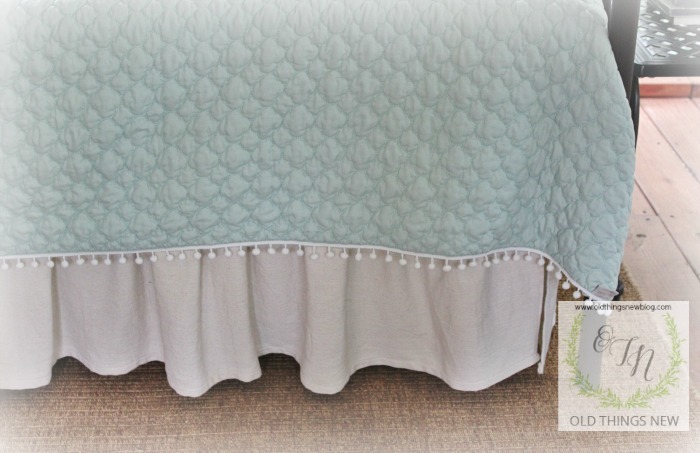 I covered the beds in fun quilts I found on sale at Stein Mart (they have the best prices on bedding and you can make purchases online) and added dust ruffles that I made from drop cloths. The bed springs are high from the ground (15″) so I can hide storage bins beneath the beds. 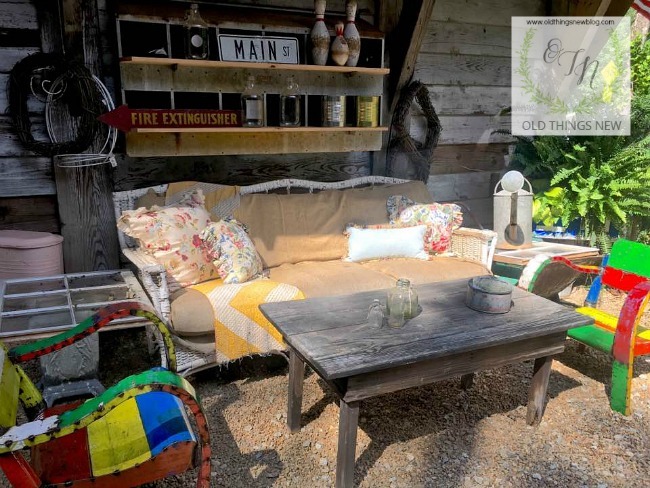 I keep outdoor pillows and cushions here when we’re going to have a long stretch of rainy weather. 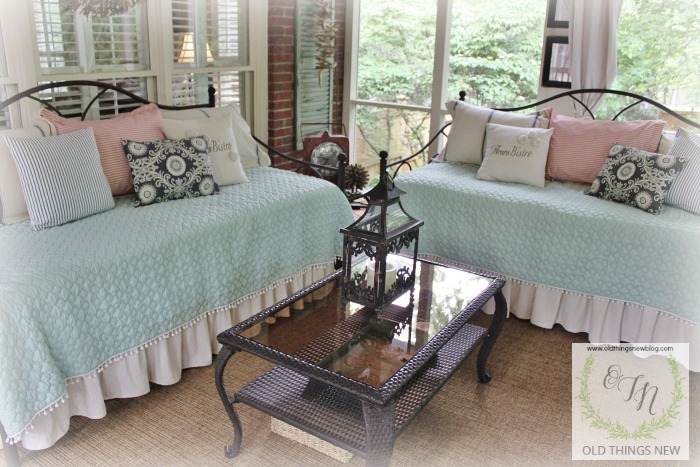 The dining table chairs have pillows to match those on the beds. 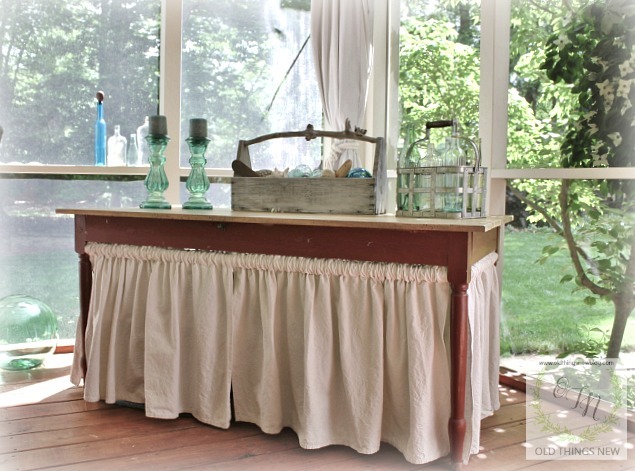 Maybe you remember these drop cloth curtains (Pollen Proofing the Screened Porch) from last year. 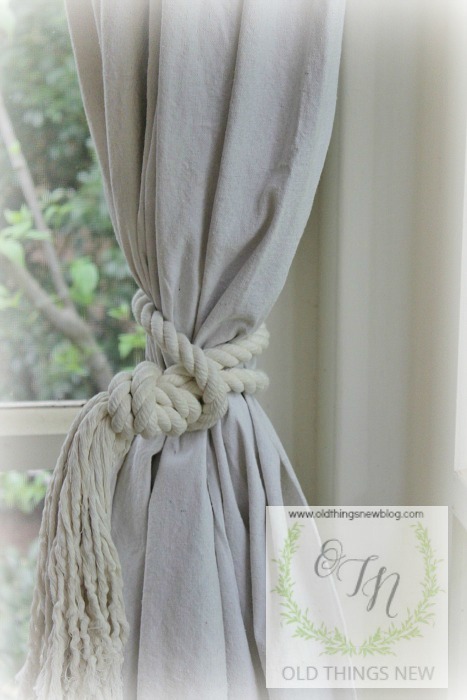 I also did a tutorial for Quick, Easy, & Affordable Drapery Tiebacks. 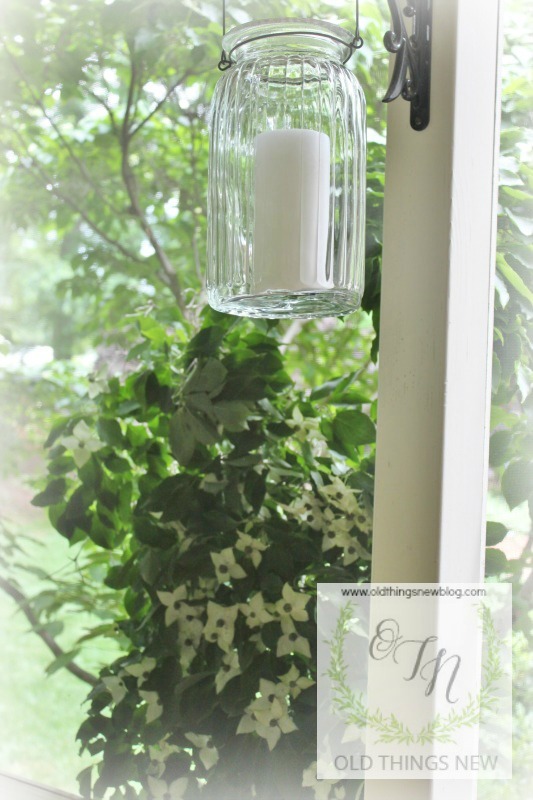 We’ve hung large candles on the porch for those nights when we like to sit in the dark watching the lightening flash. We get a lot of thunder storms here in the Summer. 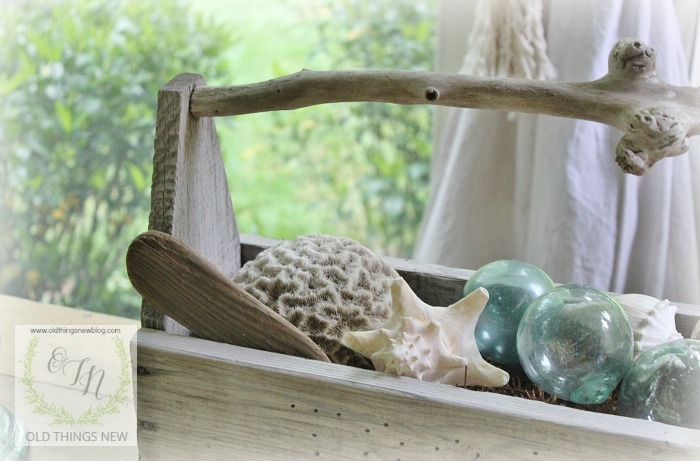 Since our porch is a warm weather room it has a Coastal theme going on. Thanks for coming along on the Sleeping Porch tour. I hope to have plenty of guests this year that will be adventurous enough to have slumber parties in the woods with me. But for now, I do believe it’s time for a Sunday afternoon nap. Hey y’all! 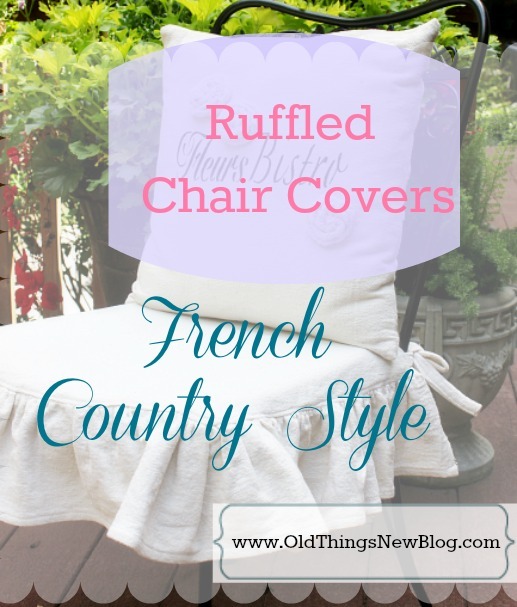 I’m back with Part 2 of French Pillows & Ruffled Slipcovers. 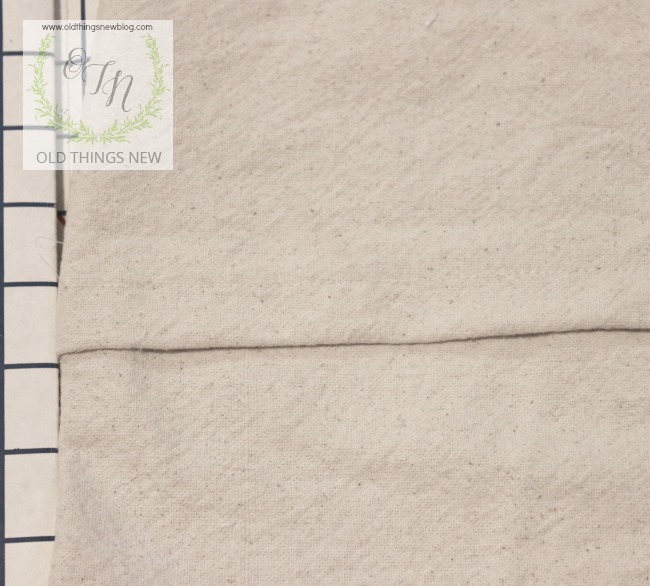 In Part 1 (HERE) I shared instructions for sewing an Envelope Pillow . 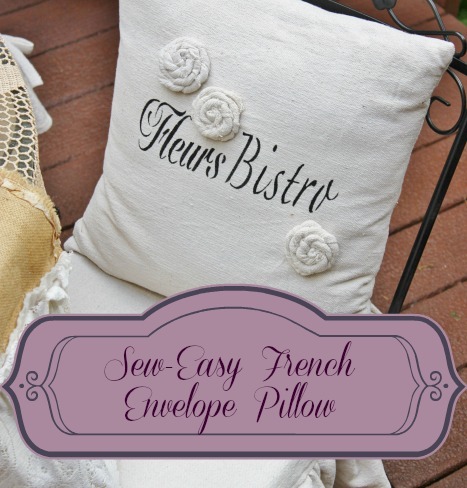 . . the easiest pillow in the world! 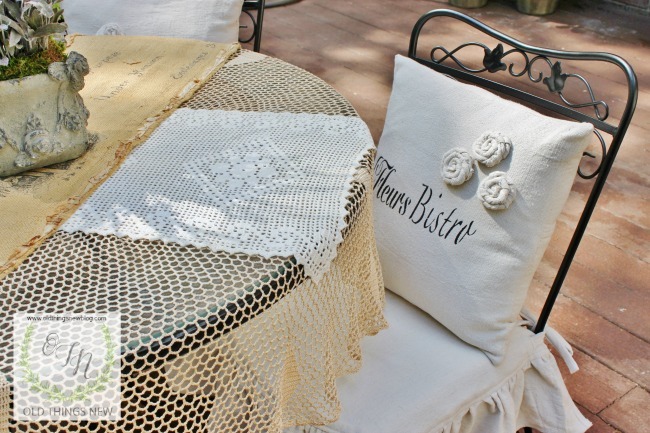 In Part 2 I will show you, step-by-step, how I sewed the Ruffled Slipcovers for my patio chairs. 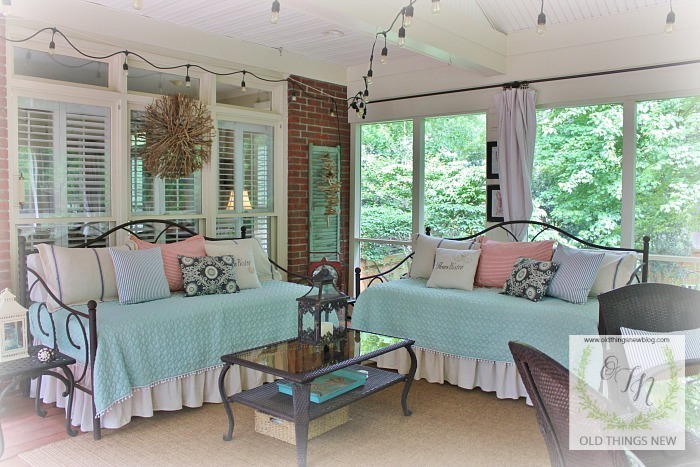 These tutorials are a result of your requests after my post about creating a French Courtyard Look on my backyard deck. You can view that post right HERE. 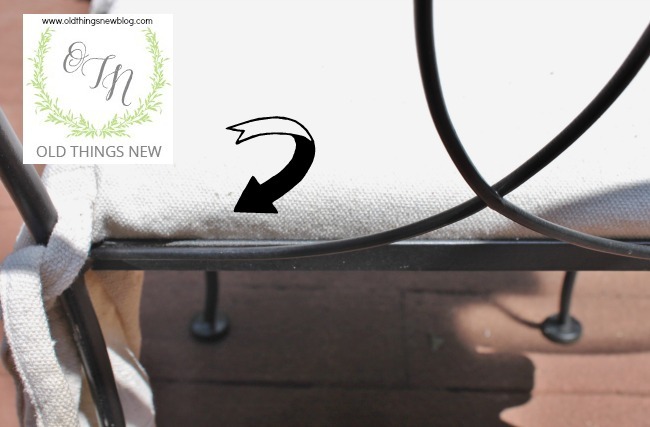 These instructions are based on the particular type of patio chair I have but with a little ingenuity adjustments can be made to fit a different style. I made my slipcovers with ruffles on three sides of the chair (you can do all four if you prefer) and added extra fabric across the back to tuck under the chair seat. This, along with ties, helps to keep the slipcover in place. 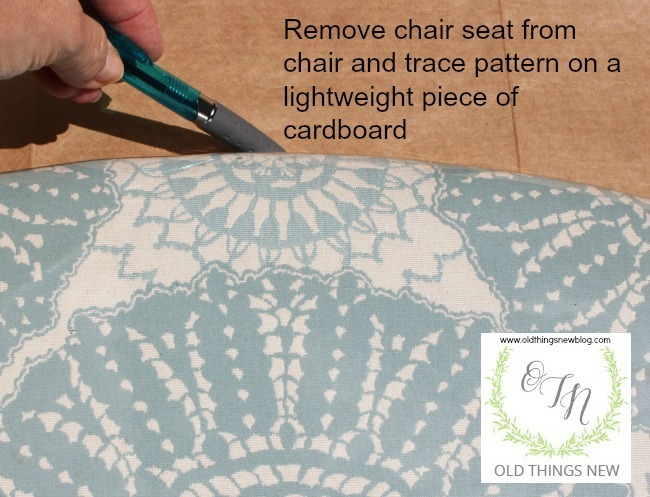 Step 1: Remove your chair seat from the chair and make a pattern by laying it on a piece of lightweight cardboard and tracing around it. 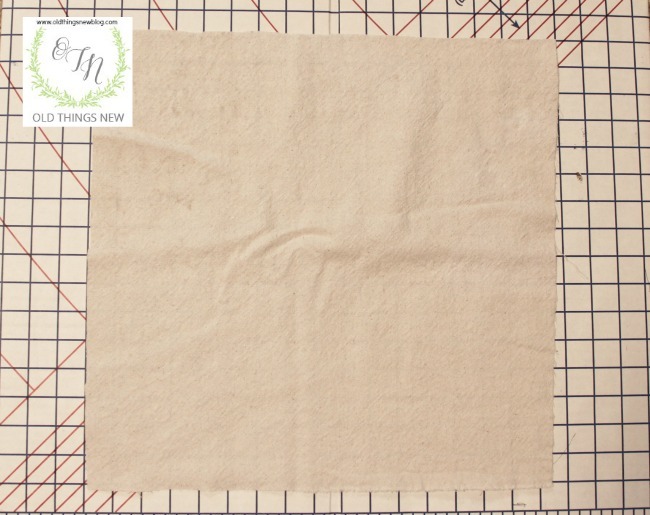 Step 2: Cut out the cardboard pattern, lay it on top of your fabric of choice (I used painter’s drop cloth fabric) and trace around it with a pencil . . . then STOP . . .read the next part carefully!
. . . Don’t cut your fabric on that line! 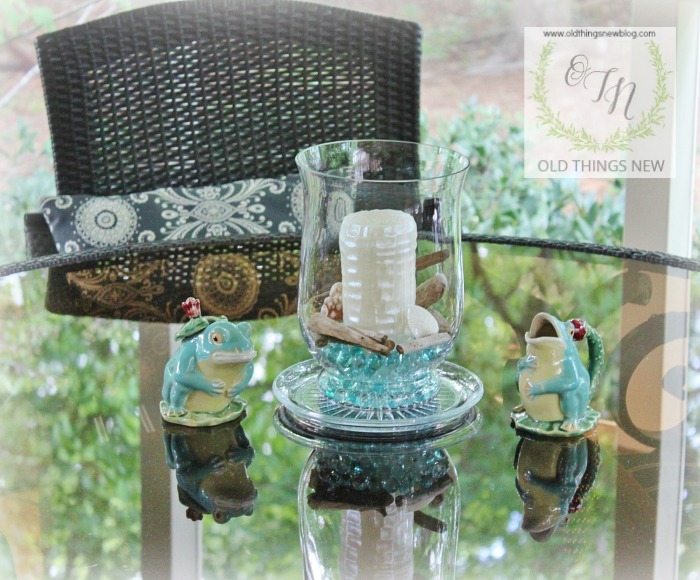 On the front and two sides of your chair cover make your cut approximately 5/8″ away from the pencil line. 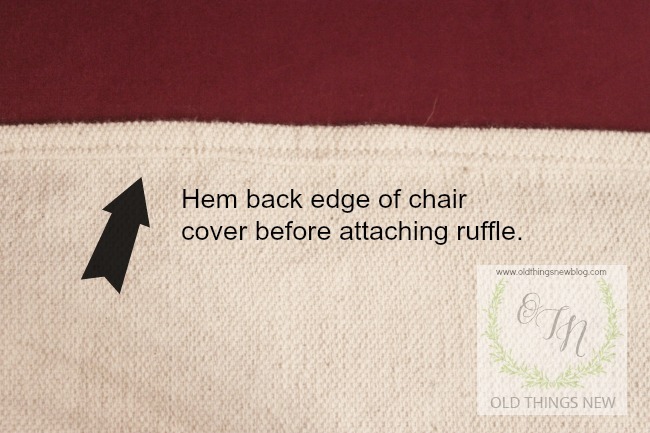 On the back side of the chair cover make your cut approximately 3″ away from the pencil line (or long enough to tuck under the back of your particular type of chair seat). Step 3: Hem back edge of chair cover by turning edge under 1/4″, then turning under another 1/4″ and hemming it on the sewing machine. Do this step before moving on to the ruffle. Step 4: Measure the distance from the back right corner of your chair seat, all the way around the front and to the back left corner. Double this number. This is the measurement you will use for the length of your ruffle. Step 5: Cut a 6-8″ wide piece of fabric (depending on how wide you want your ruffle to be) the length of the doubled measurement in Step 4 above. 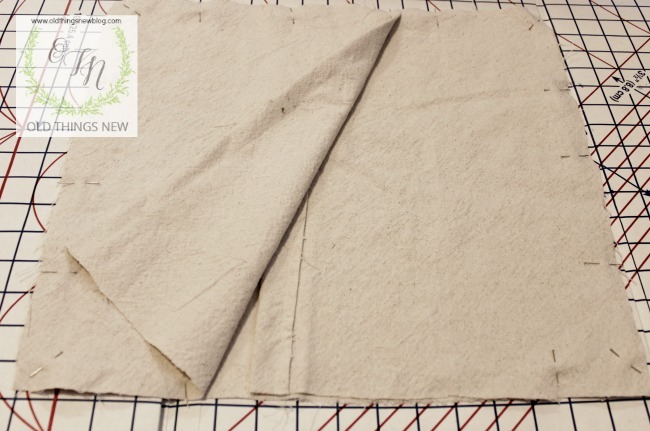 Step 6: Sew two rows of basting stitch 1/4″ apart, along one long edge of the ruffle piece. Knot one end and gently pull threads to gather. Step 6: Adjust gathers to fit your ruffle to the three sides of the chair top, and pin in place. Step 7: Sew ruffle to chair top and remove basting stitches. Step 8: Top stitch along the edge, close to the ruffle for a finished look. 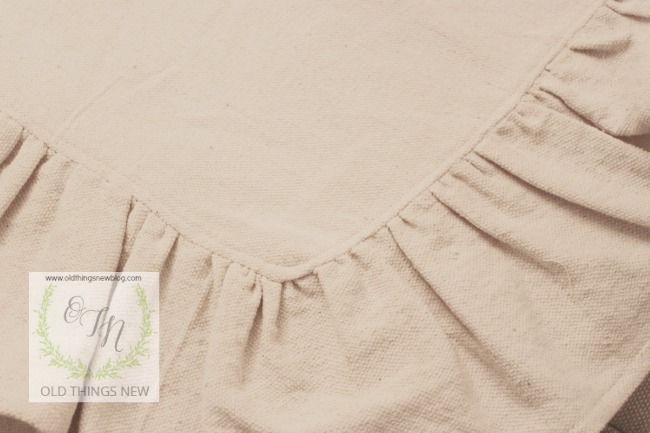 Hem the raw edge of your ruffle by turning under 1/4″ then turning under 1/4″ again and hemming on the sewing machine. Step 9: Cut four ties for each chair. Mine were 16″ long x 2″ wide. 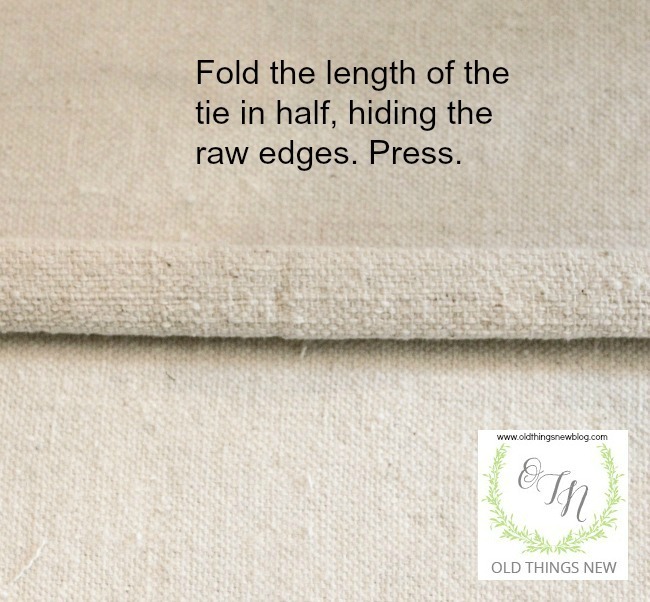 Fold the short ends of the ties under 1/4″ and press in place, then fold the two long edges inward (in the same direction as the short turns) until the raw edges touch. 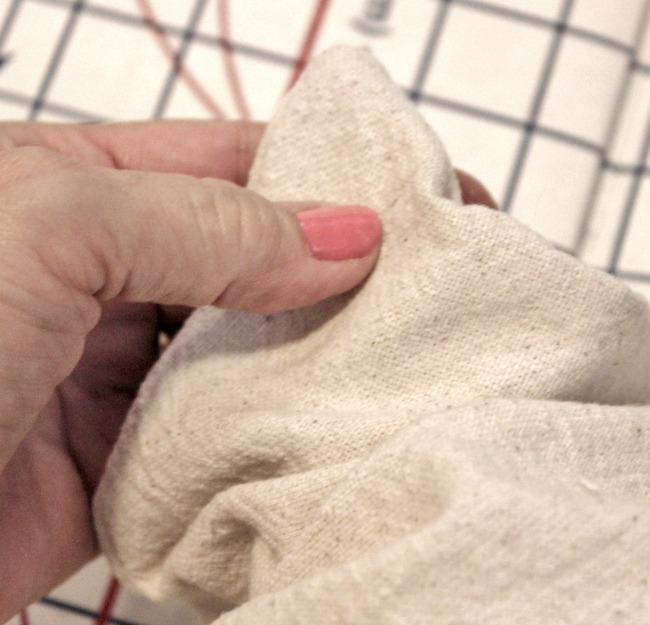 Fold the entire length in half again and stitch the folded edges closed on the sewing machine. 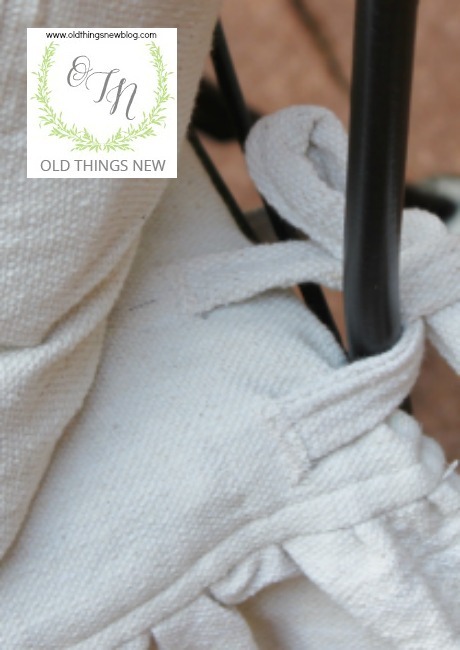 Step 10: At this point, if you have a buttonholer, make button holes approximately 2″ from the hemmed back edge of the seat cover and in the correct position for the ties to wrap around an anchor (chair frame or slat) on the back seat of your chair (every chair will be unique). Slide the ends of the ties through the open button holes and stitch them in place on the sewing machine. Tie your ties into a bow onto the back of the chair and tuck the excess fabric under the back of the chair seat. Note: I actually couldn’t find my buttonholer so I cut a slit, slipped my ties through it, used fray check on the raw edges, and sewed the ties in place on the machine. Voila’! There you have it. 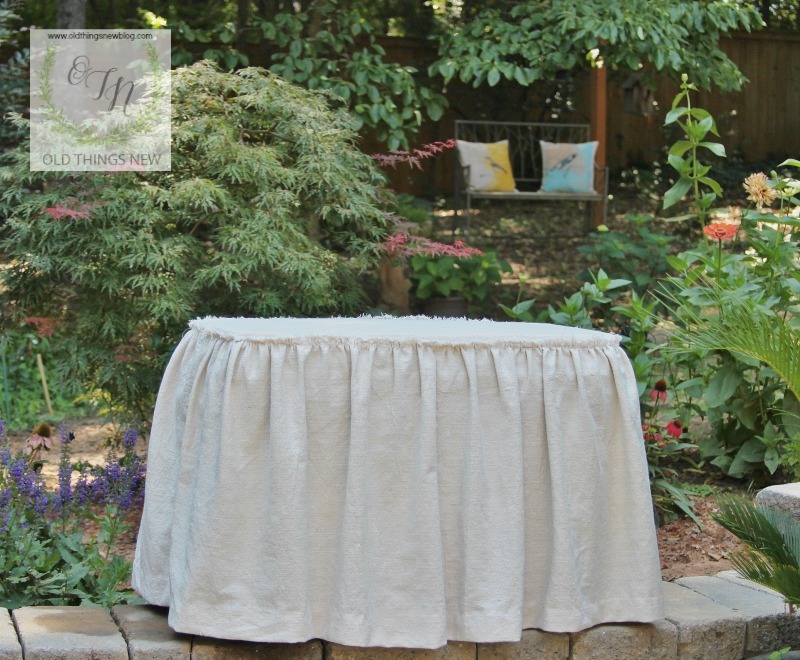 Another request from my original post was for a tutorial for the Burlap Table Runner. That will be an upcoming post later in the Fall. 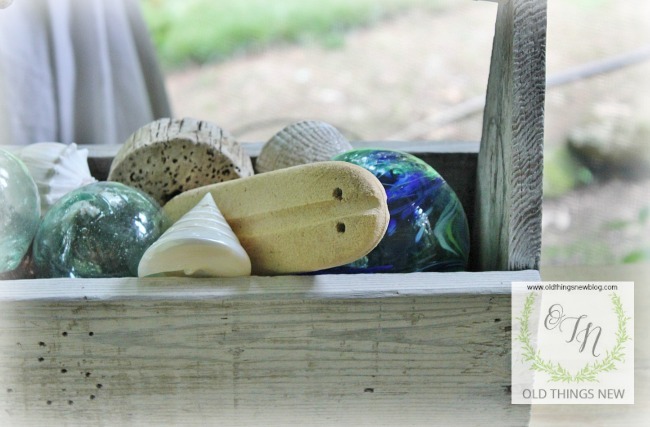 Thank you SO much for taking an interest in the things I create here at Old Things New and for being so kind as to ask for more. I am one lucky girl to have readers as sweet as you. 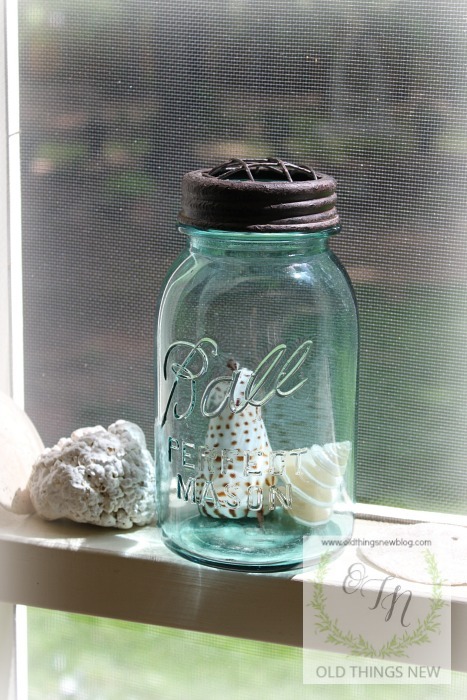 If you like this please PIN and SHARE! My first reaction was to remind him of all of the things we needed to take care of at home, unfinished projects, finances, yard work, etc., . . . and the more I talked about all that we needed to do the more I too, wanted to escape. So we did. With a promise that Monday would be an all day work fest here at home! 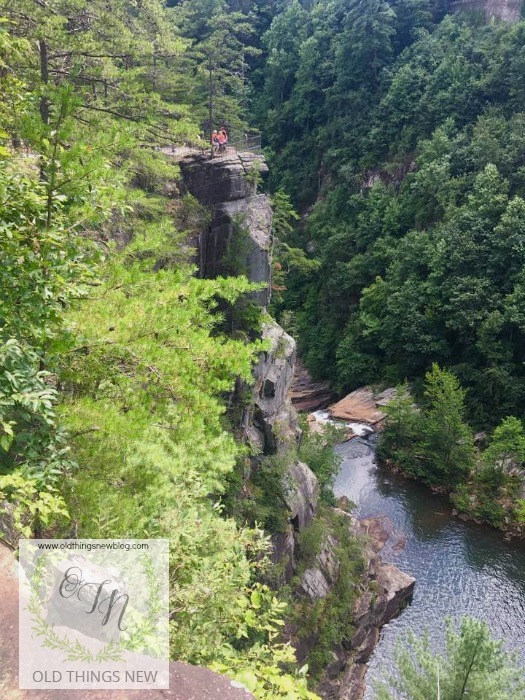 We drove up to Talulah Falls in the Georgia mountains where we hiked a little and enjoyed some spectacular scenery. 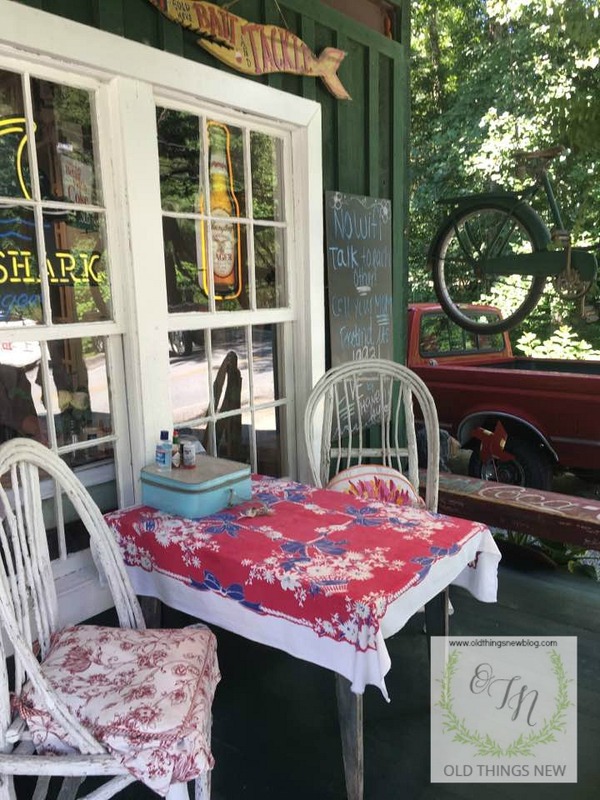 Then we drove down into Lakemont, Georgia and came across a small artist’s village where we had lunch on the front porch of Annie’s at Attic Annie’s. As much as I love being at home, sometimes getting out of my own environment is what I need to hit my refresh button. My senses were filled right here, sitting on the front porch of the diner. And the overwhelming sense of contentment I caught in this place stayed with me the rest of the weekend. Summer breezes blowing round me, watching people come and go, a Reuban’s delicious aroma, the sweet-tart tingle of lime Perrier on my tongue, the sound of mountain birds behind the chatter of other diners. Being together here, was a beautiful place to be. 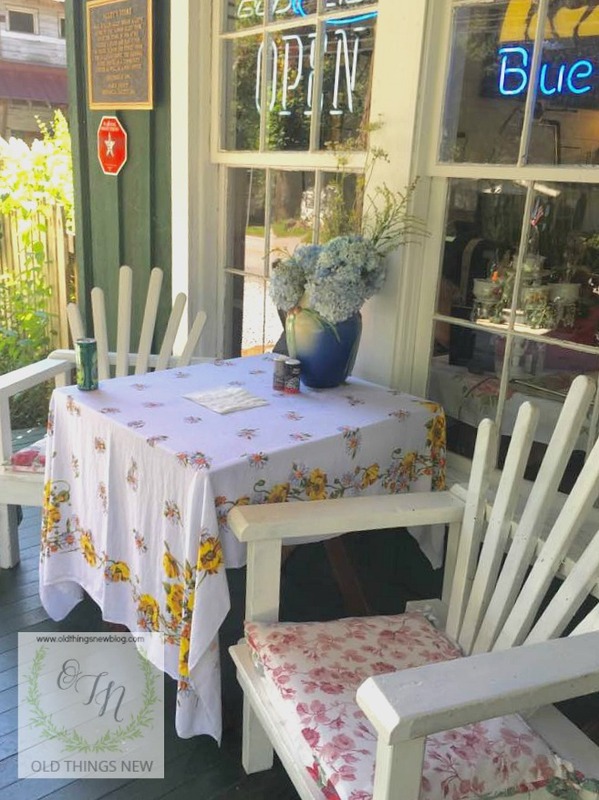 Now it’s Monday and I’m ready to seize the day, beginning by sharing this tutorial and some photos of our very own favorite place to share a cup of coffee. 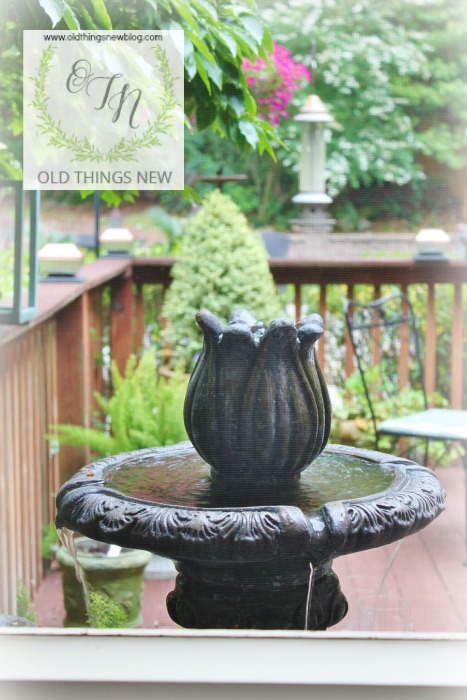 Earlier this summer I wrote a post on how I gave a French Courtyard Feeling to my backyard deck. We have thoroughly enjoyed this space this summer and when I look at these earlier pictures I can really see how much our plants have grown! I do believe our flowers like it here in South Carolina. 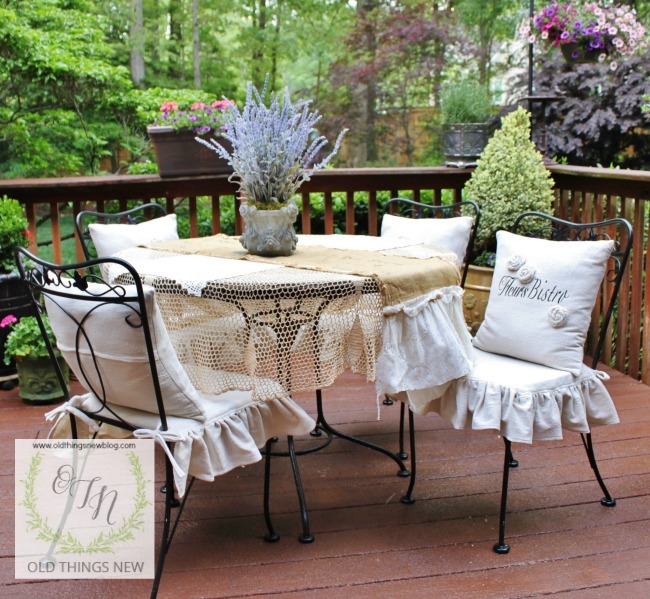 From that post I received requests for tutorials on the French Pillows and Ruffled Slipcovers I made for my patio chairs. 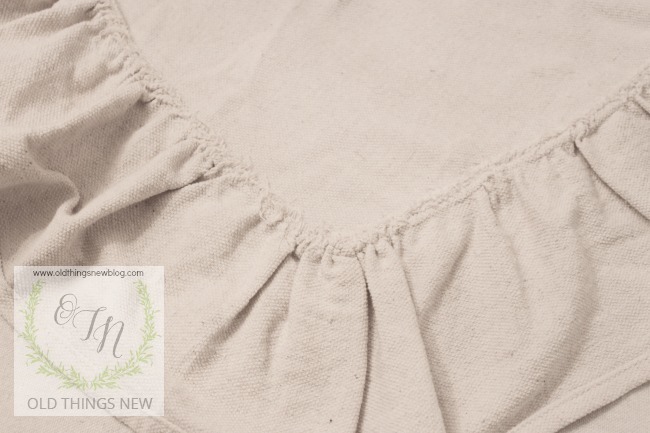 So before the summer is over, here is Part 1 where I’ll share with you how to sew an envelope pillow. 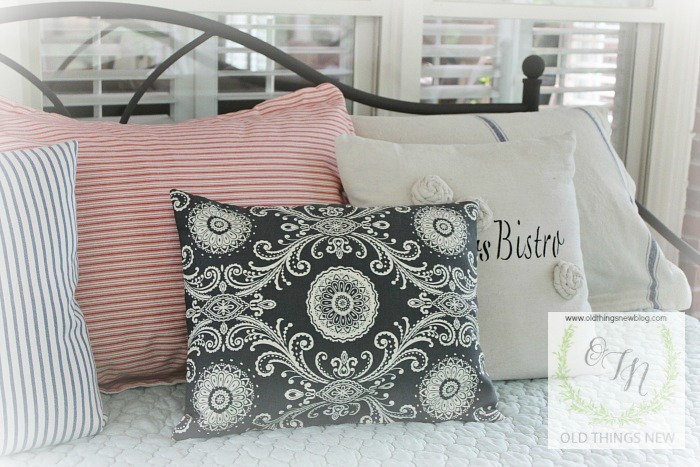 These are just the EASIEST pillows ever as there is no hand hemming or adding of zippers or other closures. 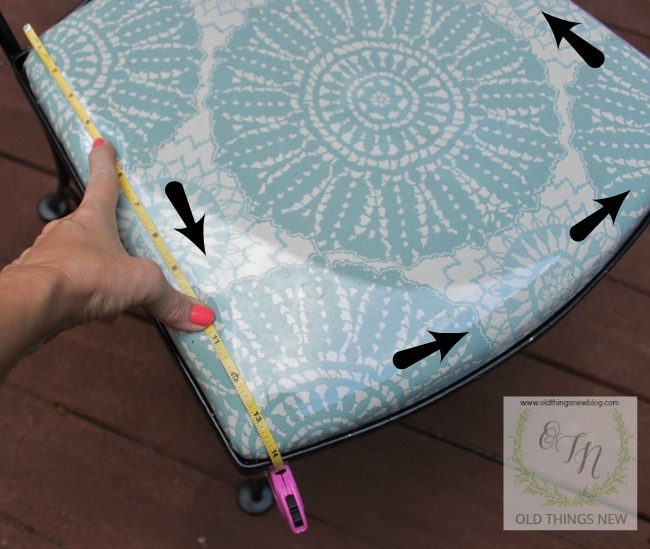 Step one: Measure your pillow form and add 1″ for seam allowance. Step two: Cut your first piece of fabric to that measurement. 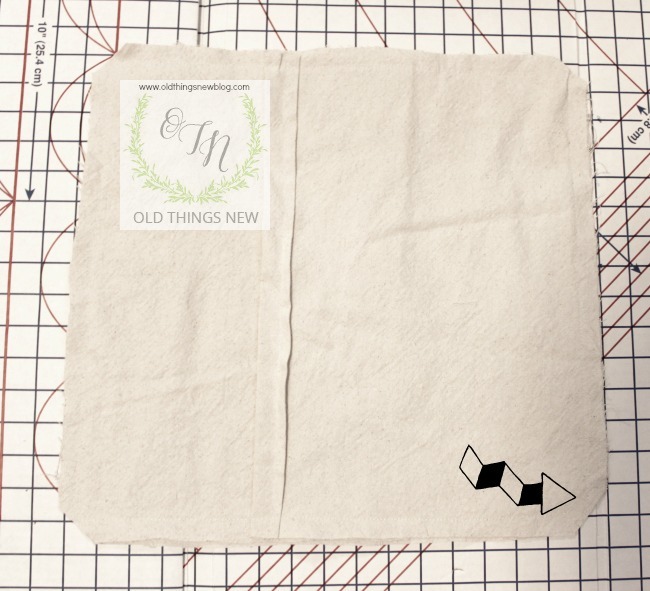 (my 14″ x 14″ pillow insert needed a 15″ x 15″ piece of fabric). This will be your pillow front. 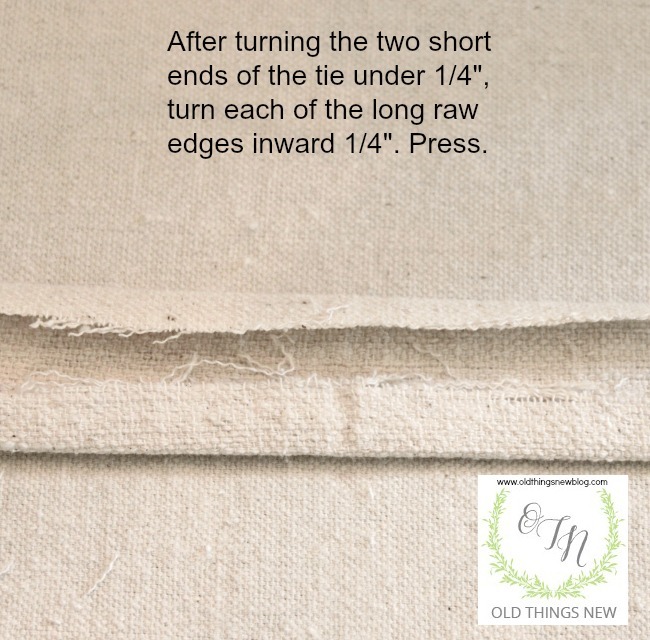 Step three: Cut a second piece of fabric the same width but add 6″ to the height (for a 14″ x 14″ pillow insert mine was 15″ x 20″). 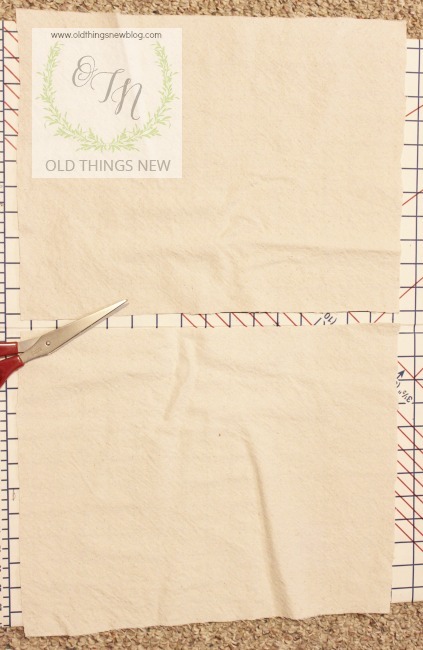 Step four: Cut your second piece of fabric in half horizontally (this gave me two pieces 15″ wide x 10″ high). These pieces will be the back of your pillow. Step five: On each of the two back pieces make a 1/4″ fold on the edges that you just cut in half. Press with an iron. Fold this same edge over a second time making a 1″ fold and press again. Stitch hem in place on sewing machine. Step six: Lay your front piece of fabric face up. 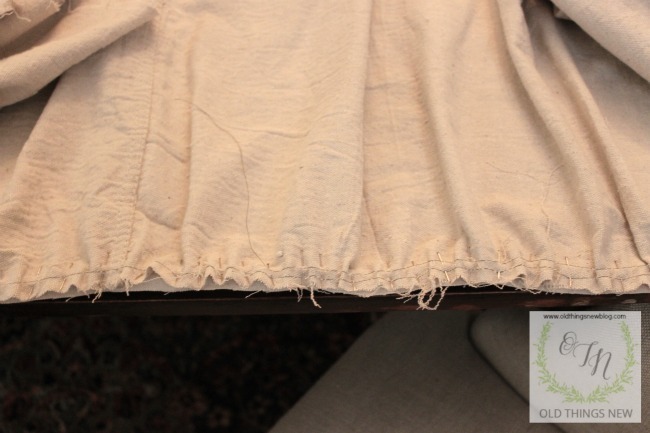 Lay your two back pieces of fabric over the front piece face down, matching the raw edges of the fabric. 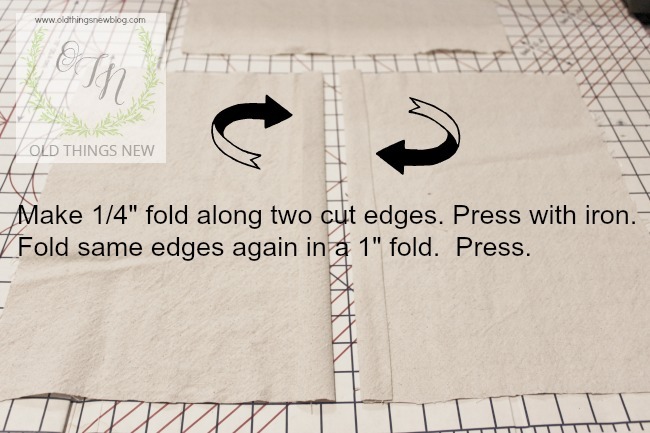 Your hemmed edges will be overlapping. Use straight pins to pin front and backs together. 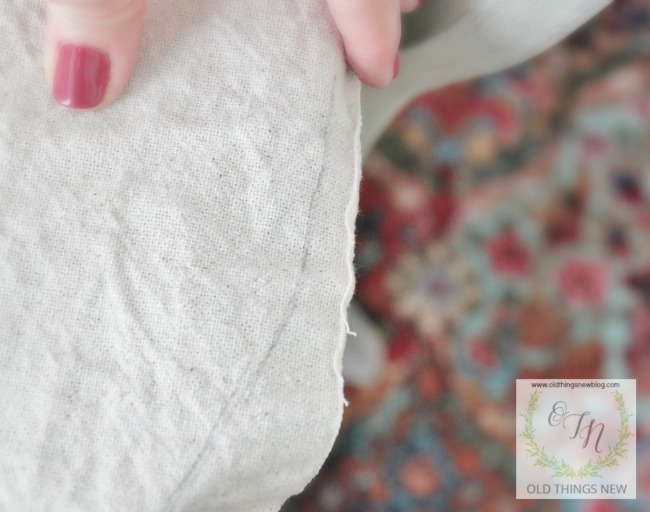 Step seven: Sew the pinned pieces together in a 1/2″ seam all around the four sides.
. . . turn right side out, and use a pencil eraser or other non-sharp object to push out the corners of the pillow cover. Insert your pillow form into the back opening and you’re done! 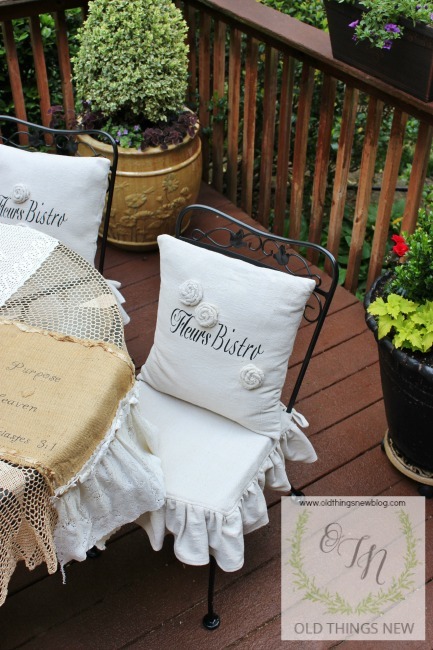 For my French Courtyard look I used French lettering stencils and acrylic craft paint from Michael’s. I also embellished them with rosettes made from strips of drop cloth fabric. 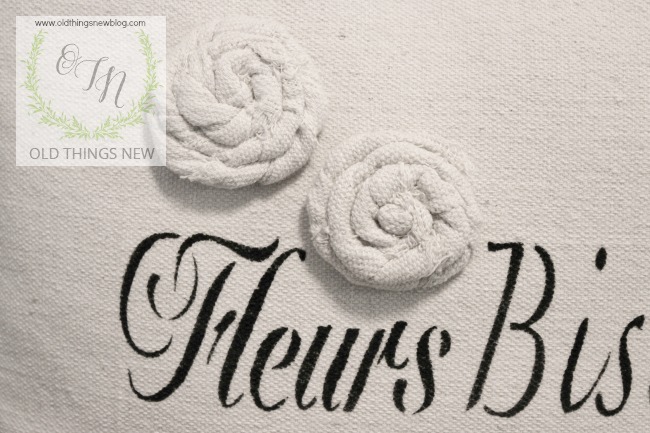 You can find a tutorial for making Rosettes right HERE. That’s the end of Part 1. I’ll be back with Part 2, Ruffled Slipcovers next time. Don’t forget to PIN me! Now, tell me. 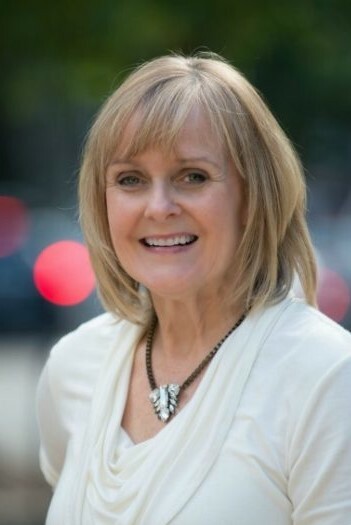 Do you have a favorite way to hit the “refresh” button in your life? What does that look like for you? Is it always something “spiritual” that you find renewal in or can it be something like my Saturday getaway? I’d love to hear your thoughts.